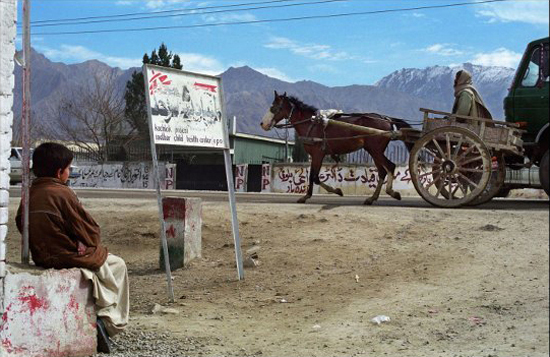 In Balochistan, Pakistan's largest and least developed province, most people have very limited access to health care. MSF supports a mother-and-child health care program in Kuchlak, a remote settlement outside the regional capital Quetta made up mostly of Afghan refugees. Here, the all-female staff in the delivery unit offer free and much needed obstetric services. A child waits in front of the mother-and-child health center in Kuchlak, a remote settlement in Balochistan. Doctors Without Borders/Médecins Sans Frontières (MSF) supports a mother-and-child health care program for mostly Afghan refugees in Kuchlak, a remote settlement outside Quetta, the regional capital of Balochistan, Pakistan's largest and least developed province where most people have very limited access to health care. Here, the all-female staff in the delivery unit offers free and much needed obstetric services. Between five and seven women in labor come to the center each day, some from as far away as Ziarat, a mountain town three hours away by car. Almost every woman who comes to the clinic has lost babies or children. Farzana's daughter-in-law, a young Kuchi Afghani nomad, has just given birth to a healthy little boy at the MSF birthing unit in Kuchlak, on the Afghan border. Descended from the nomadic tribes of eastern Afghanistan, Farzana still wears traditional, elaborately embroidered clothes, but she has abandoned her nomadic lifestyle and lives in a house nearby. She now brings many women from her community to the MSF clinic here for deliveries, vaccinations and ante-natal care. Like Farzana and her daughter-in-law, 70 percent of Kuchlak’s population is Afghan refugees. People have very little, and women and children often suffer the most. Healthcare access is extremely limited, and seeking care in the regional capital, Quetta, is still not an option for most refugees. Women frequently die during pregnancy or deliver still-born babies for a host of reasons: pregnant women continue to do heavy work, such as fetching wood and water; and they tend to give birth at home, so by the time a woman knows she needs medical help, it is often too late. A midwife takes care of a newborn child at MSF's mother-and-child healthcare program in Kuchluk. Early pregnancy can lead to a host of problems, including complicated deliveries that require safe facilities, as surgical intervention is necessary. And youth can mean a lack of knowledge–girls may not recognize the signs that they should go to a hospital. MSF provides women like Farzana’s daughter-in-law with care during delivery, and a hygiene kit–a soap and towel–which can be very valuable. If there are complications, the clinic staff can refer the woman for surgery and provide transport to the hospital in Quetta. After the delivery, mother and child go home, and two to three days later, return for postnatal check-up. Later, female MSF health visitors will call at the woman’s home for further health education. A critical part of building that trust has been the practice of having a female-only department with an exclusively female staff. Women will not seek healthcare if there are only male health practitioners available, so the MSF birthing unit has one midwife and 11 “lady health visitors” who have two years of training in basic midwifery skills. They work in shifts and offer a free 24-hour service so that pregnant women can deliver safely day or night.